Another Macworld Expo is in the books, and we say with just a touch of sadness, that we may never see its like again. Oh, sure—the show will go on in 2010, with or without Apple. But even as event organizers figure out what to do next, I feel safe in saying that future Expos are likely to take a different form than the week-long cavalcade of exhibits, demonstrations, and displays that descended upon Moscone Center last week. It’s Wabbit Season: You couldn’t go anywhere on the Expo show floor without seeing a pair of bunny ears handed out by Peachpit Press. And that’s a pity. Because while some might miss the excitement of an Apple keynote and others might rue the potential loss of a rallying point for the Mac community, one of the things that I’ll mourn is the lost opportunity to see a warehouse’s worth of products under one convention center roof (well, two roofs, if you differentiate between Moscone’s North and South halls). And I’m not just talking about the latest and greatest products—I’m also talking about the wacky, offbeat, and just plain weird things you see at an Expo. Keep your eyes peeled at Expo, and you’ll see products that can turn your iPhone into a musical instrument, grown men tearing up at the latest hardware announcement (or lack of one), and the latest in vegan iPod covers. The best products the 2009 Expo had to offer have already had their moment in the spotlight. Let’s take one last, loving look at the odd and oddly wonderful things on the show floor last week. Is there a connection between peaches and bunnies that I’m somehow missing? I ask because tech-publisher Peachpit Press settled on a clever—if not readily apparent—way of making its mark on Expo: the company handed out free bunny ears. 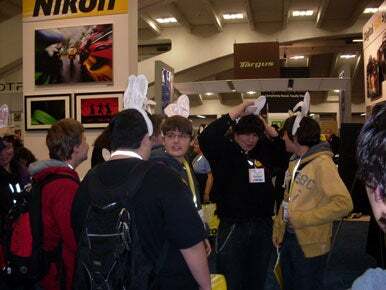 An odd hand-out perhaps, but it did the trick—by the end of the week, the number of bunny ears on the show floor seemed to multiply like… well… rabbits. Nice Wheels, McFly: This Back to the Future-esque DeLorean helped promote TechRestore’s repair services. 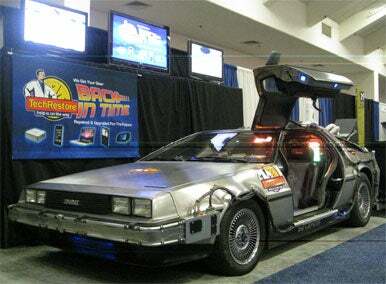 Apple’s Leopard may have Time Machine, but TechRestore can boast having the time machine at Expo. To drive home the point about its Mac restoration services, the repair and upgrade specialist adorned its booth with a replica of the DeLorean-based time machine from the Back to the Future movies. No, it wasn’t a working model; otherwise they already would have used the sports almanac to become millionaires. Obviously. You Make Some Sort of Software, You Say? 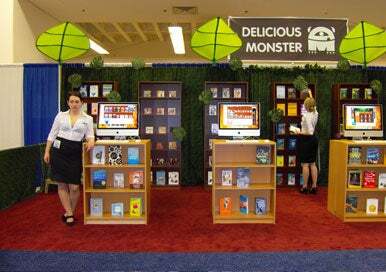 : Short skirts and plunging necklines were in full force at the Delicious Monster booth. Delicious Monster makes a highly-regarded cataloging software that keeps tabs on your books, movies, music, and any other items you own. It’s likely that visitors to the company’s Expo booth might have forgotten all about the finer points of Delicious Library 2 while chatting with the folks hired to promote the software. I’m fairly certain that’s not regulation-meeting attire for librarians these days. Aaaagh! Aaaagh! : Thanks for the night terrors, Mimobot. Mimobot creates some of the coolest USB flash drives out there. Some are in the shape of Star Wars characters—as I noted last week—while others take the form of the iconic Japanese domo figure. Why the company chose to license the Happy Tree Friends is beyond me. The gore-centric cutesy animals come in different designs, some pre-mutilation, some post. Nothing rocks the cute-centric universe quite like seeing a USB drive in the shape of a disemboweled bear. Since most of these drives make sounds when they’re installed, I can hardly imagine what horrific screams these emit… but I’m sure I’ll hear them in my nightmares. All’s I Can Say Is My Life Is Pretty Plain: Only one of these shots comes off the Macworld Expo show floor. You didn’t have to spend too much time interpreting the costumes donned by representatives of Beejive to promote the software maker’s instant messaging app for the iPhone. Which is just as well because you probably were more focused on wondering if you had wandered into Blind Melon’s “No Rain” video. Right Foot on Green: That's Google’s logo, and not a modified Twister game board. Google, the monolith search engine with an iconic name, unveiled its new logo. Every employee bore this new symbol, handing out stickers of the logos as well. Instead of text, the new Google symbol is merely a series of colorful circles that faintly outlined where the company name should be. It reminded me of the Wonderbread symbol crossed with the game Twister. Remember that time when Prince decided to rebrand himself as only an unpronounceable symbol? I’d hate to think this is the start of the Company Formerly Known as Google era.